The Dominican Republic Flag represents the country's successful fight for freedom. 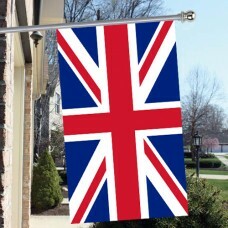 The flag's design is based around a white cross, which symbolizes salvation. Around the cross are four rectangles, colored red for blood and blue for liberty. At the center of the flag is the country's coat of arms. 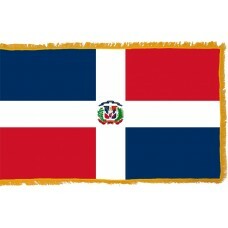 The red blood color commemorates those who died in the Dominican War of Independence in 1844. This war saw the Dominican Republic achieve independence from neighboring Haiti. Both Haiti and the Dominican Republic had previously been part of the Spanish empire. 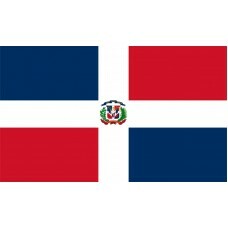 The Dominican Republic Flag was designed by Jose Joaquin Puello. Puello is a national hero in the country, because he was one of the few black heroes of the War of Independence. He had been a Colonel in the Haitian army, and he refused to take part in their planned takeover of his country's government. Puello was extremely popular among black and mulatto soldiers and the general population. Haiti and the Dominican Republic are two countries which make up the island of Hispaniola. This entire island was a slave colony under Spanish control from 1492. Christopher Columbus claimed the island for Spain as one of his first American conquests. It is the second largest island in the Caribbean Sea, after Cuba. Like many other Caribbean islands, Hispaniola provided great wealth for its colonizers from sugar plantations. These were worked by slaves, mainly from western Africa. They cleared forested areas to grow sugar cane. The Dominican Republic's climate is both hot and wet for much of the year, which is ideal for growing sugar cane. It is thought that Columbus landed in the country by accident. Its native inhabitants were the Taino people, who were not hostile to their new visitors. With their help, Columbus set up the Caribbean's earliest colonies in what is now the Dominican Republic. The country is very popular with tourists, as it has beautiful beaches and some spectacular scenery. Like the rest of the Caribbean area, it is prone to hurricanes. It is a much more popular destination than its neighbor, Haiti, which is on the western end of the island of Hispaniola. There are about five million visitors to the Dominican Republic every year. As the country's population is about 10 million people, this represents a tremendous boost to its economy. It is a very popular golfing destination, and is valued as a destination to get married. It also has rain forest areas and the tallest mountain in the Caribbean. From its roots in the colonial era, the Dominican Republic has prospered into a thriving country. 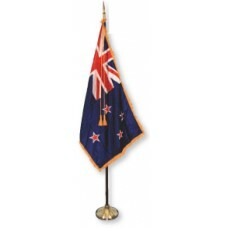 Its flag is a symbol to its people of how far they have come as a nation. The Dominican Republic Flag represents salvation, liberty and the blood of its heroes. The country's people are very proud of their heritage and their beautiful country. Into war launched itself unto death! Her slavery chains she broke. Which was sparked by heroic manliness. Many more times shall she know how to be free.